It has been a rollercoaster year for China's property market. Prices heated up to a boil in the first nine months of 2016 on progressive policy easing, and then cooled a bit when the government imposed tough home-buying rules starting in late September. While the property recovery has been shown to help drive growth, policymakers must walk a fine line to guide market expectations, since both an asset bubble and a sharp correction could pose risks to the broader economy, analysts said. China's housing market started to recover in the beginning of the year after cooling for more than a year, boosted by government support measures to reduce inventories, including interest rate cuts and lower deposits. Prices in 100 major Chinese cities rose 14.9 percent in the first nine months of 2016, with August and September seeing record month-on-month growth of more than 2 percent, according to the China Index Academy (CIA), a private property research institute. Average home prices nationwide in March, May and September rose 18.25 percent, 14.26 percent and 12.66 percent year on year, respectively, far more than the 1.28-percent rise in 2014 and 9.11-percent rise in 2015, according to the 2016-2017 report on China's housing market released by the Chinese Academy of Social Sciences (CASS) on Nov 30. The price acceleration came as excess money supply, including a surge in housing mortgage loans, led to strong investment with buyers looking to profit from further price increases in the future, said Ni Pengfei, a senior researcher at CASS. Central bank data showed that Chinese banks in August issued 529 billion yuan ($79 billion) in household medium- and long-term loans, with mortgages accounting for 55.7 percent of the total. Some speculative funds have moved to the property market for higher returns, propping up both land and home prices, Ni said. Indeed, prices of auctioned land plots in many cities were already higher than those of nearby existing homes, indicating that home prices in these areas are set to increase. This resulted in panic home buying in several cities. Data from the Ministry of Finance showed that sales of land-use rights in the first 10 months this year rose 15.2 percent year on year to 2.65 trillion yuan, reversing the trend of a 25-percent drop in the same period last year. Fully aware of the asset risks, Chinese authorities have introduced a slew of measures since late September in more than 20 cities -- including Beijing, Shanghai and Shenzhen -- to rein in home prices and contain speculative purchases. These measures, including purchase limits and tougher mortgage limits, have cooled speculation, reduced transactions, reduced the risk of asset bubbles and stabilized the market. Seven of 70 large- and medium-sized cities surveyed in the second half of October reported new home price drops month on month, up from two in the first half of the year, according to the National Bureau of Statistics. Total floor space of sold apartments in major Chinese cities in November experienced the first year-on-year decline in 21 months. On a monthly basis, the decline was 10.5 percent, with Beijing and Shanghai dropping 7.9 percent and 24.6 percent, respectively. "The regulatory curbs are necessary and timely," said Yu Liang, president of China Vanke, the country's leading property developer. He said the property purchase restrictions have brought skyrocketing home prices under control and promoted sustainable development of the property sector, adding that an overheated housing market would threaten the macro-economy. But these regulative curbs are not enough, Yu added. More importantly, a long-term mechanism that includes increasing land supply, raising the proportion of residential land and improving land use efficiency should be established for a healthy property market, he said. 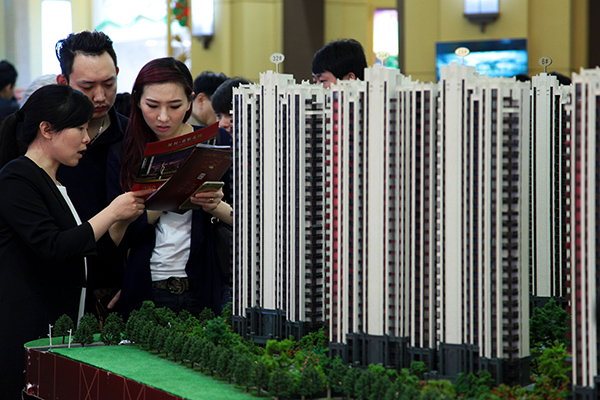 Liu Hongyu, head of the real estate research institute of Tsinghua University, agreed, noting that a long-term mechanism, featuring increased land supply and a sound housing finance system, real estate tax system and urbanization infrastructure construction, should be established to guide market expectations and stabilize buyer sentiment. A meeting of the Political Bureau of the Communist Party of China (CPC) Central Committee last week also sent signals over the central government's determination to establish a long-term mechanism for a stable and healthy property market. For the year ahead, China should study and establish a long-term mechanism compatible with conditions in China and market laws to ensure stable and healthy development of the real estate market, according to a statement released after the meeting. In the latest Moody's report released in November, the global rating agency forecast a stable outlook for China's residential property market in 2017, but regulatory risk remains high in light of the rapid growth in property and land prices. It noted that a further dramatic tightening of regulatory measures to curb persistently high property prices, leading to a fall in national contracted sales of more than 5 percent over six to 12 months, could shift the sector's outlook to negative. It has been a rollercoaster year for China's property market. Prices heated up to a boil in the first nine months of 2016 on progressive policy easing, and then cooled a bit when the government imposed tough home-buying rules starting in late September.